We all know that I love honey for accenting foods and drinks, brewing mead, as well as just on its own by the spoonful. But did you know that I also love it for use as a do-it-yourself spa treatment? 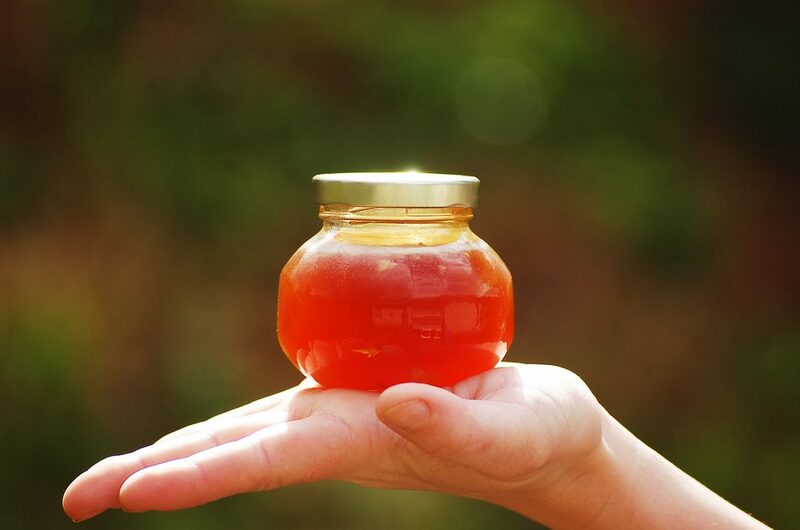 Honey can serve as a wonderful product to add to your beautification rituals! I encourage you to use local honey from a natural beekeeper so you can be assured of its purity. Some of the big box stores carry honey that comes from China or Argentina, and they are often supplemented with High Fructose Corn Syrup and other less-than-ideal chemical treatments. One more thing – honey is a gentle moisturizer, so you can use this on sensitive or sunburned skin, too. Tie back your hair and roll up any long sleeves. Wash your face with warm water and a gentle soap. Pat your sweet face dry with a clean towel. Look at how pretty you are! Smile at yourself in the mirror. Dip your fingertips into a jar of honey, and apply small dollops of honey directly to your skin all over your face. Use the fingertips of both hands to very gently spread the honey around, including on your lips and in the folds around your nose. Gently press your fingertips all over your face, lifting them up, and pressing back down. As the honey dries a bit, you can feel this process pulling your skin. This brings blood flow and vitality to all of those tiny blood vessels! Keep patting your wonderful face until the honey dries. This should not take long at all, just about one minute. Rinse your hands, and sit down for a little bit. This would be a great time to meditate, paint your toenails, or anything else calming and self-restorative. I like to jump into a nice warm bath, personally. After about ten minutes or so, run some water and splash your face clean. If you rinse with nice warm water, you shouldn’t have to use soap. Let yourself feel clean and new. Pat your face dry again, and look at your glow! This simple ritual helps to remove blackheads and restore vitality to your skin when performed regularly. I find it to be a totally enjoyable activity, and it truly works to help clean the skin and leave you feeling moisturized! Has anyone else tried this? Hello my name is Phoenix and I love honey too! I love to use it on almost everything. My question is how often should I do the honey face mask? I have some blackheads I’d like to get rid off and I’ve used honey a bit in the past. The honey facial is safe enough to use as often as you like. I use it at least once a month, but could honestly stand to do it more often. I appreciate your comments, and hope you enjoy your honey spa time! Thank you Amber. I’ll probably do it weekly just because I love it so much! Me, too, Rebecca! 🙂 Try adding a drop or two of lavender essential oil to that honey for extra cleansing for oily skin, and it also is magic for healing burns!